We are thrilled to share with you the news that Robert Inglis, Director of Jive Media, has won the National Science and Technology Forum Award in the category for “Science Communicator for Public Awareness over the last 5 years”. The award was given to Robert for his “contribution to the development of the discipline of science communication through innovative and exciting media”. The announcement was made at a (stunning) gala banquet at Emperors Palace, hosted by the Honourable Minister of Science and Technology, Mrs Naledi Pandor, on Tuesday night. 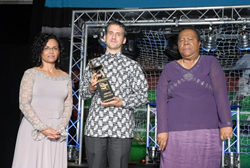 The NSTF Awards honour South Africa’s top scientists. Jive Media would like to congratulate fellow winner in this category, Mr David Kramer, CEO of the Sci-Bono Discovery Centre. We think he’s a wonderful and brilliant man and are honoured to be on a platform with him. 1. For the Mission MeerKAT Comic series his thanks went to Marina Joubert (Southern Science) and Kim de Boer and Adrian Tiplady of the Square Kilometre Array (SKA). He also thanked Dr Sharon Grussendorff, Rico of Madam & Eve, and the extremely creative and hardworking Jive Media team. 2. For The Maloti Drakensberg Experience his thanks went to Leonore Beukes, Kevan Zunckel, the scientists at MDTP, and again to all those who worked so tirelessly on this book. He also thanked the NSTF, and SAASTA for their continued support of Jive Media and Science Communication in general. We, once again, thank you all for your ongoing support of Jive Media. We learn and grow so much through every bit of our work together, and we have you all to thank for that!